Q. When did the martini glass first appear? When did a pint glass with a bulge on the top 1/4 of the glass appear? 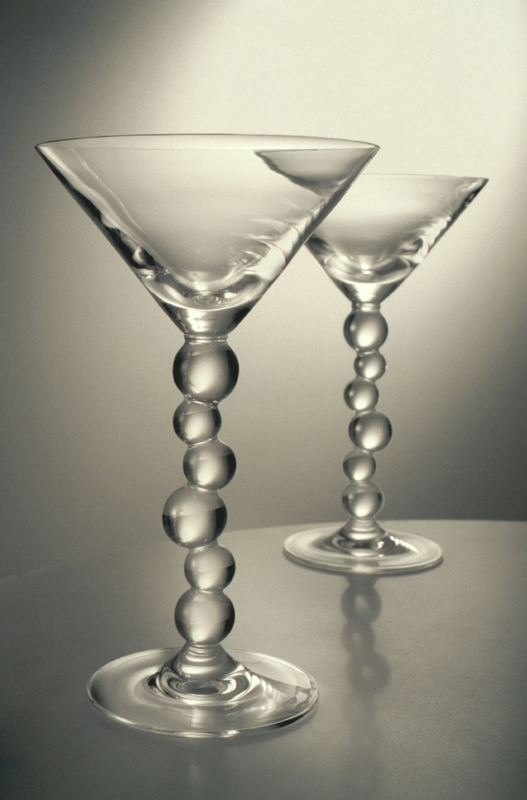 I'm writing a book on design and need the following facts checked: 1) When did the martini glass first appear? 2) re: a pint glass with a bulge on the top 1/4 of the glass: when did this design first appear? Where? I believe that Albert Pick patented this design in chicago around 1914? Is this true? Or did it appear in the 1920s? According to Max Rudin in "There Is Something About A Martini. ", featured in American Heritage in 1997: "By the middle twenties, reflecting homegrown modernist design trends as well as influences from the Bauhaus and Wiener Werkstatte, new avant-garde shapes had appeared in studio glassware, among them the now iconic stemmed straight-flared V. It originated as a simplified and geometrically abstracted version of the saucer champagne glass, which had replaced the flute at the turn of the century." If you wished you could also consult trade catalogs from the time period to try and locate a more specific date. You may also wish to review drinking glass and/or goblet patents from the mid-twenties, it appears several designs may illustrate the shape you are researching. Our LibGuide on Drinking Vessels Through History highlights Martini Glasses, providing a list of books, articles, design drawings, and a video on the subject. Tipsy Martini, Dante Marioni, Corning, NY, 2004. CMGL 122126. We have found that United States Patent D44616 illustrates a 'drinking glass' that appears to be a tumbler with a banded bulge. The patent was assigned to Hugo Pick of Chicago, Illinois. He applied for the patent on December 9, 1912 and the patent was granted on September 2, 1913. The patent is for "design for a Drinking-Glass". You can view an image of the original patent here via the US Patent and Trademark office. The Albert Pick & Company Book of Supplies for Restaurants Hotels and Institutions from 1928 contains an ad for a "No Nik-Safedge" Tumber, which appears to be the realization of the design patented by Hugo Pick. The glass was available in a 5oz, 6oz. 7oz. 8 oz, 10oz. 12oz. and 14oz sizes.